shorthand they are eligible to apply for this Stenographer vacancies of Sikkim High Court. There are only 3 vacancies in these Stenographer jobs of Sikkim High Court. 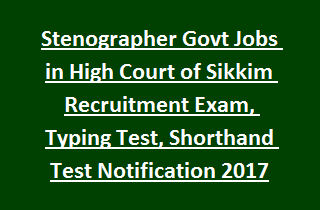 Selection for stenographer vacancies of HC Sikkim will be based on shorthand test, typing test and written exam. Last date for submission applications for this High Court of Sikkim Stenographer jobs recruitment 2017 notification is 13-11-2017. Exam Pattern, Syllabus, Typing Test, shorthand test, age limits, pay scale and other details are given below for this HC Sikkim Recruitment of Stenographer vacancy. For bother posts candidates must have computer knowledge certificate and Shorthand and Typing knowledge. Candidates who are qualified Practical Examination they are only called for written exam. Paper 1 will be conducted for 100 marks and exam duration is 2 hours. English Language: Essay Writing, Letter Writing, Idioms and Phrases, synonyms, antonyms, common errors, prepositions and one word submissions. Paper 2 will be conducted for 50 marks and exam duration is 1 hour. Interested candidates can submit their application form on or before 13-11-2017 along with attested copies of all required documents and 3 pass port size photos. Mention clearly your address, mobile number and email id details clearly.